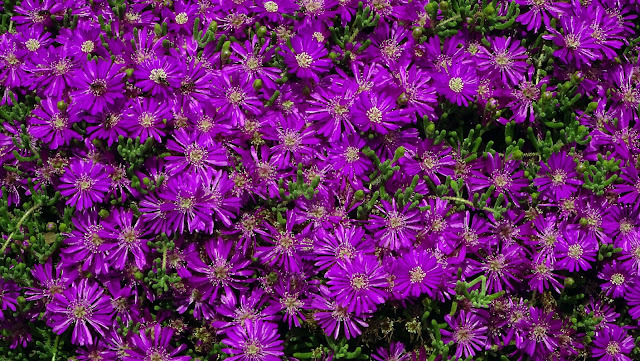 Drosanthemum ("dewflowers") is a genus of succulent plants in the ice plant family, Aizoaceae, native to the winter-rainfall regions of southern Africa. Most species bear colorful flowers. The name Drosanthemum means "Dew-flower" in Greek, and refers to the characteristic shiny translucent papillae, which cover the succulent leaves and flower buds. The species shown here is Drosanthemum hispidum (Linn.). 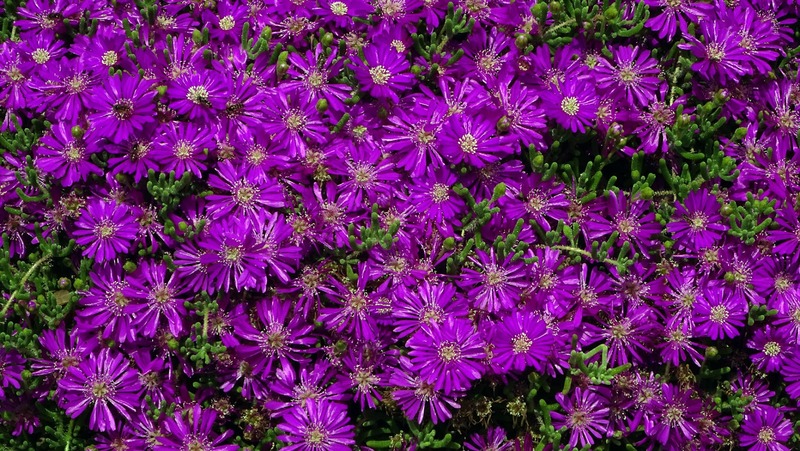 It is a succulent, mound-forming perennial, 60 cm tall, 90 cm wide, leaves up to 2.5 cm long. These leaves and the stems are covered with papillae looking like dew drops or glassy beads, glittering in the sun, hence the common name. Flowers are profuse and a rich purple or lavender. Blooming in summer, this plant forms a dazzling mound of colour for the well-drained garden. The plant requires full sun and regular watering in summer. It should be kept rather dry in winter, and it does better with good drainage. It is a salt resistant plant. Please add your own flower photos on the Linky list below. That is some gorgeous purple! This color is amazing, Nick! a marvelous photo of this wonderful flowers. I always enjoy your visits, thank you so much!! WOW, what a colorfull plant! What beautiful intense colors of these flowers. What a wonderful colour and plant. That is the deepest purple I have ever seen. Nick, amazing color. Thanks for sharing. How pretty that the papillae look like dew drops! Thanks for hosting. Wow! Nick, great color, I love them! Love these dewflowers Nick, such a gorgeous color and a great photo. Wow !! Such a beautiful color !! This color is amazing, Nick. Have a nice weekend!